The timing of the article’s publication acted to brutally counter growing support for Assange that arose in the wake of a clearly unjust UK ruling. Essentially, the publication of the smear attempted to deflect attention from the revelation of corruption in the ongoing detention of Assange, and to assassinate his character in the process. The Intercept’s decision to publish the article at such a time unfortunately serves to characterize the outlet as a servant of the same US deep state that The Intercept has gained a reputation for – at least in theory – opposing. The serious errors contained in The Intercept’s character assassination of the Wikileaks co-founder were quickly dismantled earlier today by independent journalists including Suzie Dawson, Caitlin Johnstone, HA Goodman and others. That Micah Lee, who has engaged in continual attacks against Assange on social media, would be allowed to contribute to an article of this kind represents a fundamental conflict of interest in the work, not to mention the factual inaccuracies and assumptions it makes without so much as pausing to take a breath. The claims made in The Intercept’s hit piece regarding messages sent privately by Wikileaks’ Twitter account were disingenuous on multiple levels, beginning with the assumption that Assange was the sole author of the texts. The inference is clearly stated in the article, destroying any shred of journalistic integrity that might be expected from a well-respected news outlet. Assange addressed the intentional inaccuracy of The Intercept’s coverage of the messages via Twitter. Given the premise that The Intercept’s smear aimed at Assange was integrally flawed, the most important aspect of the publication in the mind of this author is that it came just over 24 hours after a critical ruling was made by a UK magistrate that upheld an arrest warrant against Assange. In light of this context, the importance of the Intercept’s smear piece is what it was meant to distract from. As Disobedient Media previously reported, UK magistrate Baroness Emma Arbuthnot, ruled against Wikileaks co-founder Julian Assange when she upheld an arrest warrant against him yesterday. Arbuthnot is intimately linked to the interests of the same military industrial complex whose wrongdoings have been so thoroughly exposed by Wikileaks. 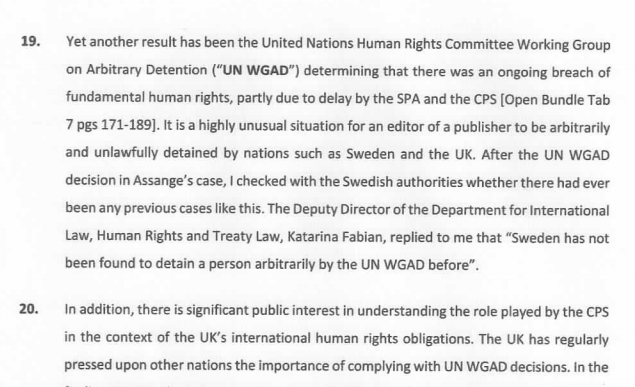 The decision by Emma Arbuthnot to uphold the warrant that was created in response to a now-defunct Swedish investigation reveals the fundamental cause for Assange’s ongoing arbitrary confinement. Namely, the US and UK military interests and corrupt power structures that have consistently been exposed by Wikileaks’ publications. Such entities have been chronically embarrassed by Wikileaks’ publication over the years, stretching from the Iraq War Logs to US State Department Cables to the DNC emails and CIA malware in Vault 7, which earned Assange the ire of CIA Director Mike Pompeo. It appears particularly calculated and outright malicious that The Intercept would publish a tabloid-esque hit piece aimed at Assange one the day after Arbuthnot’s decision. The timing of The Intercept’s publication revealed the outlet to be little more than a mouthpiece for the United States intelligence community, in the same class as the Washington Post and other legacy press outlets. As this author noted, the comment indicating that Assange’s health “could be much worse” was particularly disturbing in the context of an unknown white powdery substance sent to Assange last week, along with a death threat. In response to the UN WGAD’s findings, Arbuthnot wrote in her ruling that she gave “little weight to the views of the Working Group.” That Arbuthnot’s decision was overtly unjust is plainly visible to any casual observer. As Assange and his supporters have often noted, the Wikileaks co-founder has already served three times the maximum penalty for skipping bail. Critically, the decision combined with the personal connections of the magistrate involved revealed in broad daylight once and for all that the real impetus for Assange’s ongoing detention stems from military powers that have no interest in justice whatsoever, not from a Swedish investigation of sexual abuse. The obvious injustice of the ruling spurred an upswell of support for the Wikileaks Editor-Inc-Chief, which makes the timing of the Intercept’s article particularly malicious. The outlet’s shameful attempt to kill support for Assange at such a critical moment goes beyond sloppy journalism and enters the territory of acting on behalf of the American deep state.